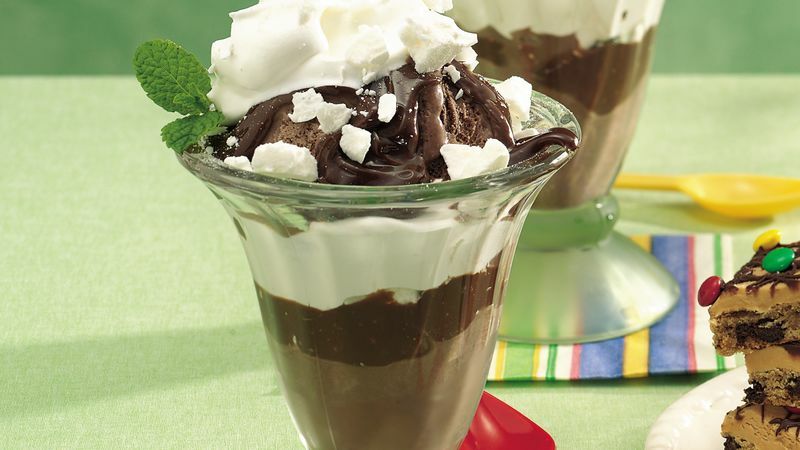 In medium bowl, combine whipped topping and mint extract; stir gently to blend. In each of four tall glasses, layer 1/4 cup ice cream, 1 tablespoon chocolate topping, 1 heaping tablespoon crushed cookies and 2 tablespoons min-t-flavored whipped topping. Repeat layers. Sprinkle with remaining crushed cookies. Serve immediately. Meringue cookies can be found in grocery and discount stores. Look for them in the bakery aisle. Humidity can soften meringue and change its texture. Keep the package of cookies tightly wrapped. Serve the meringue parfaits immediately after assembling them. Layer colored candy sprinkles in each parfait and sprinkle a few on top for some kid-friendly color.